Today marks the beginning of the Week of Prayer for Christian Unity – the week leading up to the Day of Pentecost which we sometimes call the birthday of the Church. Having been committed to the ecumenical movement for many years I am familiar with the sentiments we seek to address during this week. On the one hand there is room for some remorse over the history of division and exclusion that we have all been part of over the centuries. Yet, on the other hand there is much to celebrate as we have found more and more opportunities to act in unity with our Christian brothers and sisters. 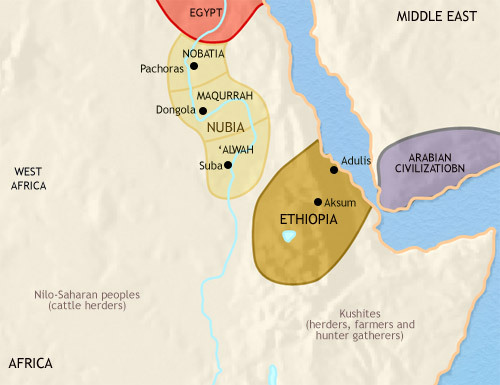 I was reading up a little about the history of the Christianisation of the Nubian Kingdom many centuries ago. Some suggest that the Christianity reached the ancient Kingdom of Makuria during the first century AD and this is plausible in context of the spread of Christianity into a near neighbour – Ethiopia. A few centuries later during the 6th Century, however, we seem to have records of a Byzantine Queen Theodora determining to send missionaries to the Kingdom – but she got involved in a race with another group to get there first. A missionary sent by Emperor Justinian, and representing the true Orthodox Church tried to get there first and failed. These two competing expressions of Christianity were born out of the Credal Councils of the Church and divided over the divine nature of Jesus. The Nicene Creed affirmed that he was fully human and fully divine, but Queen Theodora and her church friends believed that Jesus was always and only fully divine – they were called Monophytes. Alas, a century further on the Arabs invaded and tried to force Islam on the Nubian people – some areas resisted for a thousand years but others converted – but they did not forget their Christian heritage. The Missionary movement of the 19th Century very largely concentrated its activities in what we now call South Sudan, but their work revived the church in the Nuba regions. It is sad that the missionary movement replicated the denominational divisions of Europe which were largely meaningless to the Sudanese people – but there you go. Part of the problem for the church in South Sudan is that the dioceses are based on ethnic tribal groupings of people – which is a way of ensuring a bishop will be recognised by all in that diocese. Culturally, they are unable to accept diversity within the church. That might help you understand why there is still so much strife in South Sudan even though they were given their independence a few years ago. It seems that divisiveness is almost instinctive to us – yet the prayer of Jesus in John 17 is a call to us all in the church to be really counter-cultural. It calls us to act against our instincts. It calls us to go against all our cultural norms. So, how do we need to change in order to live this way? In our study this week of Marcus’ Borg’s book, The Heart of Christianity, we gave some consideration to this idea. We were talking about being Christian in a world that is pluralistic – where there are not just other religions, but many different ways of being Christian. Some people over the years have been very cautious about the work of the World Council of Churches. They have somehow gotten the idea that the goal of the Council is to create a single homogeneous church which, of course, might mean we have to change a bit. What Borg and the Council of Churches seem to get is that rather than trying to find some small areas which we hold in common and work together on the basis of that, we should be so self-contained in our confidence about the faith we have that we can celebrate the different faith that others have without feeling like we are compromising our faith. If we can confidently celebrate our diversity then we will be able to demonstrate the Unity of Spirit that Jesus is praying for. This is not a case of putting aside any of the things we hold dear – rather it simply involves allowing others to do the faith differently than we do. It is a way of saying that God and Jesus are too big for any one church to say it all. If we can grasp this then we can celebrate those other Christians we might work with because when they are added to us we might actually be getting closer to all that God wants us to be. So often in the Church we think one of our primary tasks is guarding the doors – checking up on who gets in and does not. That is what our Creeds and Statements of Faith are about. We use these to decide if someone can be included in our definition of what it means to be a Christian. Somehow, when I consider the teachings of Jesus, I think God isn’t like that nor does God want us to be like that. Our starting point should be that everyone is IN. When we are IN and together like that, and when we seek to explore how we should be practicing the Christian life together – the things that we should be doing in Jesus’ name – then we will find far more people on the inside than if we had tried to keep them out at the door. Jesus says very clearly that our WORK is to live in Jesus – to abide in him – in just the same way that Jesus abides in God the Father. As we all live in this close and intimate relationship with Jesus, even though we might do the outward practices of our faith and order in the church differently, we will become the answer to Jesus’ prayer. TRINITY C - Can We Make Sense of the Trinity?